Mercedes Helnwein (born 1979, Vienna, Austria) is an artist, writer and filmmaker. Her father is Austro-Irish artist Gottfried Helnwein. She grew up in Austria, Germany and the United States and lives now in Ireland and Los Angeles. 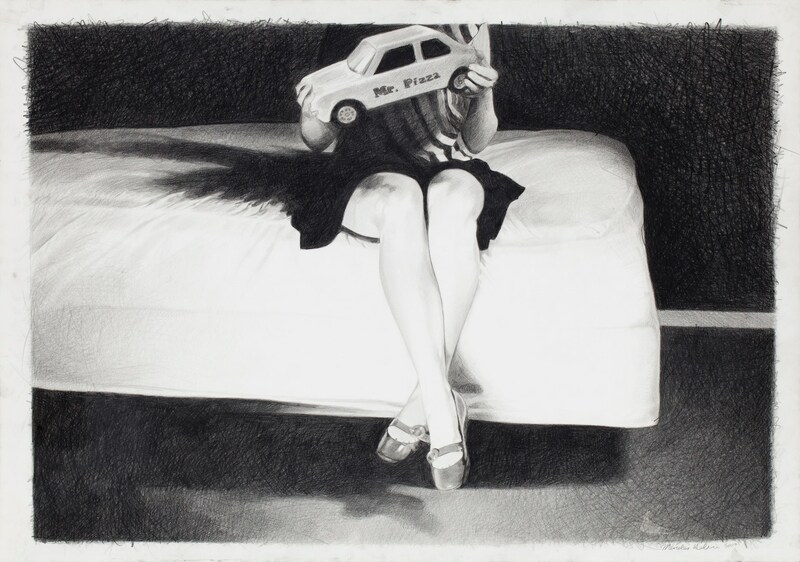 Mercedes Helnwein's large-scale drawings, most of which are done with black pencil, colored pencils, or pastels, suggest storyboard or graphic novel frames, although their contents refuse to cohere one picture to another. Helnwein does not so much tell stories or even capture moments in her drawings as she triggers possibilities. Her technical style underscores a sense of displacement. In an interview with the LA Times Helnwein is quoted as saying: 'To be powerful, art should be honest, direct and thought-provoking, It should shake you up, take you out of your element. Making people uneasy is one way to do that.' Helnwein's art debuted in 2003, with her first group exhibition hosted in Downtown Los Angeles by art collector and actor Jason Lee. This exhibition was followed by regular self-instigated one-night-shows at spaces throughout L.A., often with photographer Alex Prager with whom she founded Devil's Porchlight Press in 2004. Thereafter, Helnwein began to exhibit in New York, Berlin, Dublin and London. Mercedes Helnwein contributed art to the Beck album, The Information (2006), and appeared in his music video for 'Gamma Ray', filmed by photographer and filmmaker Autumn de Wilde. She has worked with the following galleries: Blackston Gallery (New York), Merry Karnowsky Gallery (Los Angeles), The Shooting Gallery (San Francisco), Pool Gallery, Dittrich & Schlechtriem (Berlin), and Bespoke Gallery (Dublin). In 2010 Damien Hirst acquired the entire work of Helnwein's 'Whistling Past the Graveyard' show in London.